Prior to the start of the school year we were asked to pick an "animal name" for our classroom. The name we chose for our 4 year-old class was "The Awesome Angelfish." Since then, we have tried to adapt our classroom to the theme by including fish and other sea creatures in our "Under the Sea/Angelfish" classroom. Our biggest project and the one we are most proud of is our "Awesome Angelfish Aquarium Library." 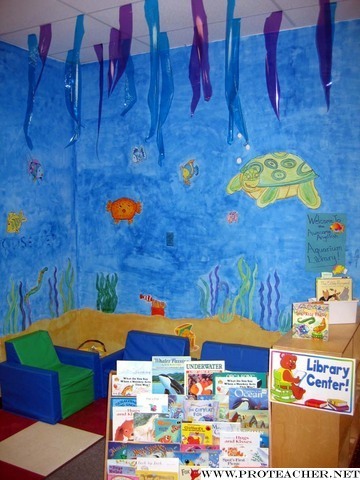 Throughout January and early February we worked on a 100% teacher created mural to make our library corner like an "under the sea" scene. We finally finished and the kids LOVE it! The mural really brightens up our room and draws the kids into the library area! In addition to the books that correspond with our monthly and weekly themes, we are working on building up a permanent classroom collection of Under the Sea themed books. We would love to win first prize so we can add more of these as well as some beanbag chairs and fish pillows to enhance our cozy corner!